"THE LITTLE HAMPTONS" : Patience, a Reproduction of an Antique Izannah Walker Doll by The Little Hamptons. 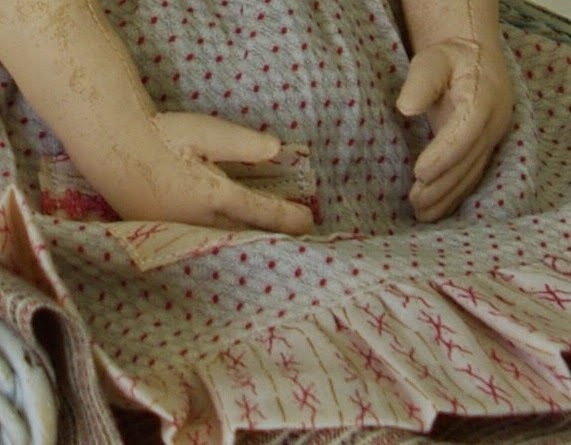 Patience, a Reproduction of an Antique Izannah Walker Doll by The Little Hamptons. A new girl looking for a home. A reproduction Izannah Walker doll, made from the mold taken from the original antique Izannah Walker doll named Patience. She is 18" tall and dressed in a pretty outfit that I have machine and hand sewn from 1800s cotton antique clothing. The pin tucks and hand worked edging on the petticoat and bloomers is all original. All the clothing is removable and has hand sewn button/buttonhole or loop fastenings. She has a very authentic aged look. I have painted the ringlets at the sides and wisps at the back. She has nice brown eyes and a soft, pale pink lip and cheek colour. She has a second skin, chemise, undies and petticoat and apron, all made from antique garments and fabrics . She is signed and dated on the back of her shoulder plate and she has signed and dated swing tags. You can email me using the link on the right hand side of this page if you'd like to know more about my dolls. .